There is a new ceiling set that will cap the number of refugees allowed in the United States at 30,000 people for the 2019 fiscal year. Secretary of State Mike Pompeo said that the lowered ceiling was due to a “massive backlog” of refugee cases that still needed to be addressed. According to Pompeo, the United States has a backlog of over 800,000 refugee and asylum cases that are waiting for a verdict on their request, and an additional 310,000 requests are expected to appear in 2019. In the United States, both refugees and asylum seekers are expected to be able to demonstrate a well-founded fear of persecution based on their race, religion, nationality, political belief or membership in a social group. This can already be a daunting task, but heightened security measures have made the process even more labor intensive for the officials investigating claims and lengthened waiting times for those seeking to enter the United States. Despite increased concerns about terrorism, Amnesty International stated that there was “no excuse” for not allowing a higher number of refugees to enter the United States. Meanwhile, Pompeo argued that America’s first priority should be focusing on the refugees and asylum seekers who were already in the country. Pompeo also stated that the lower ceiling should not be treated as the “sole barometer” of American assistance to refugees. 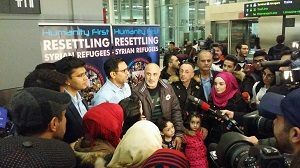 The lowered ceiling for refugees is likely to remain a controversial subject, and it is sadly one of those issues where there is no clear cut solution that both vets refugees claims successfully while still avoiding leaving people who seek safety out in the cold. One can only hope the answer to this question can be found in the near future.